My brother’s wife makes A-MAZING jam butter cookies! She would send over a dozen or two at a time and my family would devour them in 3.2343543656553 seconds. Being a dessert lover, I obviously asked her for the recipe. I do not like jam in my desserts (like the jam in the middle of danishes and things of that nature), but I love these cookies. 1. Preheat the oven to 275 degrees. 2. In a large bowl, cream together the butter and sugar (make sure the butter is room temperature). 3. Then, add in the flour. 4. Knead the dough together for 15 minutes or until the ingredients are fully mixed together and there are no lumps. 5. Make heaping tablespoon balls of dough and place them on a baking sheet. 6. 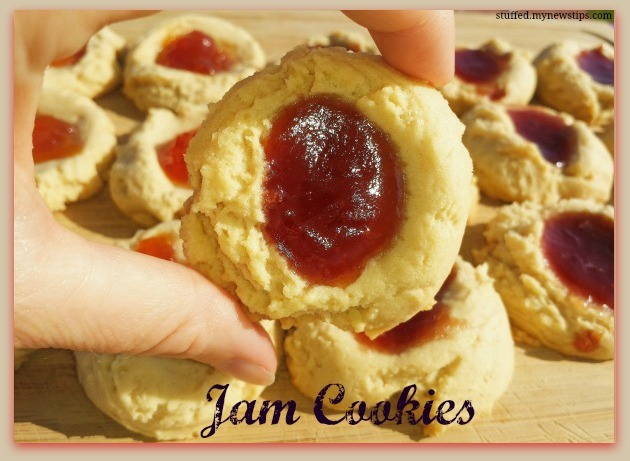 Use a spoon or your thumb to create an indent in each cookie and fill the indents with about a half tablespoon of the jam of your choice. Be careful not to overfill the cookies or you’ll have a mess on your hands! 7. Place the cookie sheet in the oven for about 30 minutes, or until the bottoms of the cookies are slightly browned. 8. Wait until the cookies are cool until you move them or they may crack or crinkle. I may or may not have eaten like 18 of these in two days… reheating each cookie in the microwave before eating them. Do you like jam in your baked goods? What is your favorite flavored jam cookie? These look so good. I have a feeling they are going to fast in my house also. Haha yes, this is definitely not a bikini friendly recipe to try! I have always loved these cookies and have never made them! Thanks for sharing at Fluster Muster Linky party! I will pin and share everywhere. Thanks so much and thanks for hosting! You definitely won’t regret trying them! Oh these look yummy! I love that you could use your fav flavor of jam! I haven’t tried heating them up but I will have to try that for sure! Thanks! I tend to like most desserts heated up so I might just be weird in that way. 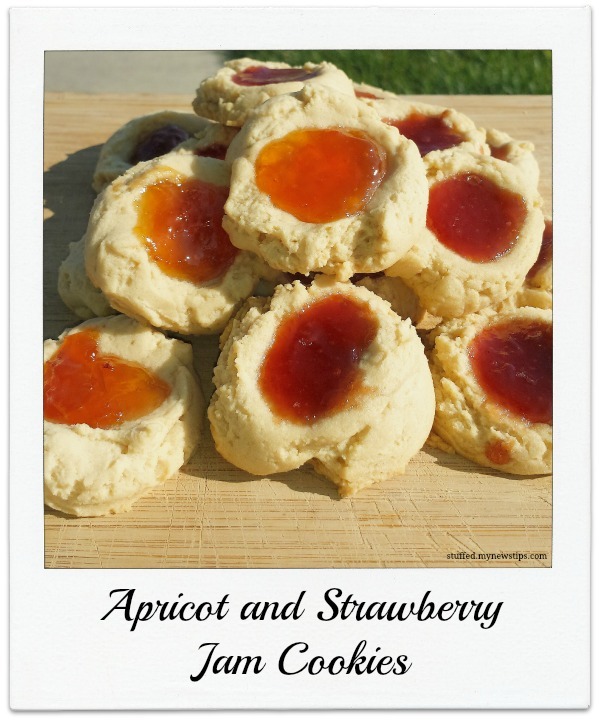 We will just love your Jam Cookies, they look awesome! Thanks so much for sharing with Full Plate Thursday and have a great weekend! These look really tasty – going to try with some apricot jam! Thanks, that’s a good choice! Enjoy!